When talking about the three new characters he co-created at the outset of The New Teen Titans, writer Marv Wolfman has said that, while he’d probably eventually run out of ideas for Cyborg and Starfire, he felt like he could continue on writing Raven stories forever. I find it sweet and admirable to see how Wolfman has stuck to that nearly 40 years later, continuing to pen the occasional new Raven story even as the character has changed so much from the one he originally conceived. 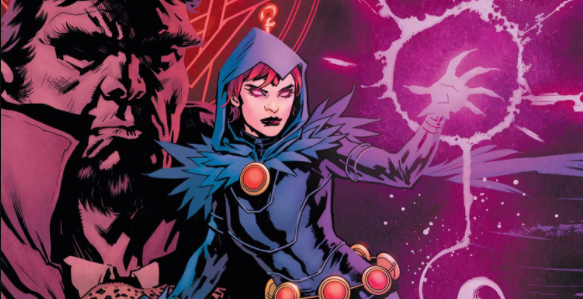 I can’t say I’m super familiar with this new incarnation of Raven, as I lost patience with the New 52 Teen Titans relaunch shortly before her reintroduction, so it’s hard to know whether the aspects about the character that don’t work in Raven: Daughter of Darkness 1 come from Wolfman, or were already a part of this take. I was always a fan of Wolfman’s original “fragile pacifist empath” vision for the character, so the attempts to blend in some of the animated series’ sarcasm don’t work super well for me. Her powers are frustratingly undefined, and the “Raven” facts that litter the story feel forced and strained. In fact, while I’ve always liked Wolfman’s dialogue, much of it just feels awkward in this issue, especially from the teenage characters, who sit around a campfire talking about how much fun they’re having with all the dead-eyes enthusiasm of coma patients. The teenage slang is especially puzzling. Thankfully, Wolfman gives us the option to view it through Raven’s POV as something that’s supposed to feel foreign and off-setting. That’s the nugget of character that works like gangbusters throughout the issue: Raven’s isolation. Raised in a cult, living as a superhero, she has no idea what it means to be human, be loved, or even have fun, and it provides compelling conflicts and pathos for the character. It’s always been a part of Raven’s character, and this issue shows that Wolfman hasn’t forgotten what made the character work in the first place, and that he’ll continue to find his Raven no matter how much she changes on the surface. This micro-experience I had with Raven translates to this issue as a whole on a macro-scale. It’s often a frustrating read, with a strange framing device that will no doubt eventually be vital to the series, but for now feels unrelated to the story at hand, at least one inexplicable jump in time and location, and a tease of yet another Trigon invasion plot that nearly had me quit the issue out of frustration before it was revealed that it was all an illusion. Yet, beneath it all there’s a strong core, the nugget of a good plot, the prospect of Raven finding somebody like her, helping somebody like her, learning and growing from seeing how far she’s come in comparison. That’s a story I’m interested in reading, even if it’s buried beneath a few imperfections.